Valentine’s Day is almost here. I can understand why not everyone likes it- the sudden price hikes in restaurants and hotels, the endless buy me now advert for cuddly toys and random heart shaped objects. However, as I’ve said in my last blog post, I do quite like it. Me and my boyfriend will usually just stay at home, we’ll either cook a really nice meal together (this is a rare occasion for us) and then later on curl up on the sofa with a movie and some nibbles. We are both workaholics, and the norm for us is to get home from our day jobs and immediately to our respective desks and start work again, so we make a rule that there will be no work, no phones, no social media that evening. I was thinking about dessert (well that’s not unique to Valentine’s day) and I really wanted to make cupcakes this year for us. One a dessert after the meal, and many to nibble on whilst watching a movie together. Perfect. I’ve told you before about a baking website I really love called We Bake. It’s almost a baking social media site, and is the community that rewards you for baking. You can upload and download recipes, whilst sharing tips on baking, ask questions you might have about how to get the perfect meringue peaks, whilst sharing your creations with others to like and comment on. There’s even challenges on there where if you upload your recipe and photos, you can win prizes. Personally I just think it would be awesome to be crowned “Star baker”. 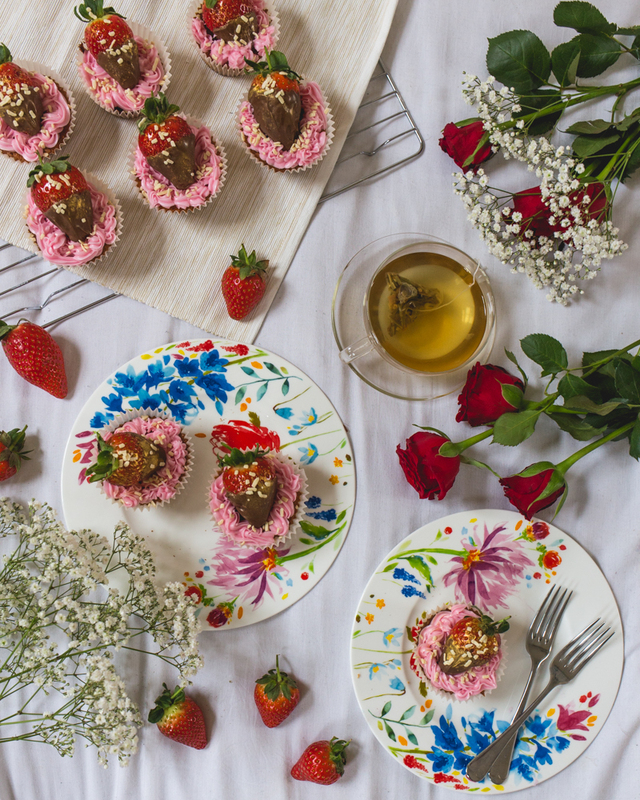 We Bake currently has the Valentine’s Day ‘Bake Brighter Days’ community challenge which I’m taking part in, check out my recipe here. You can also win a £50 Red Letter Days Voucher every day until the 14th so make sure you sign up and get involved. 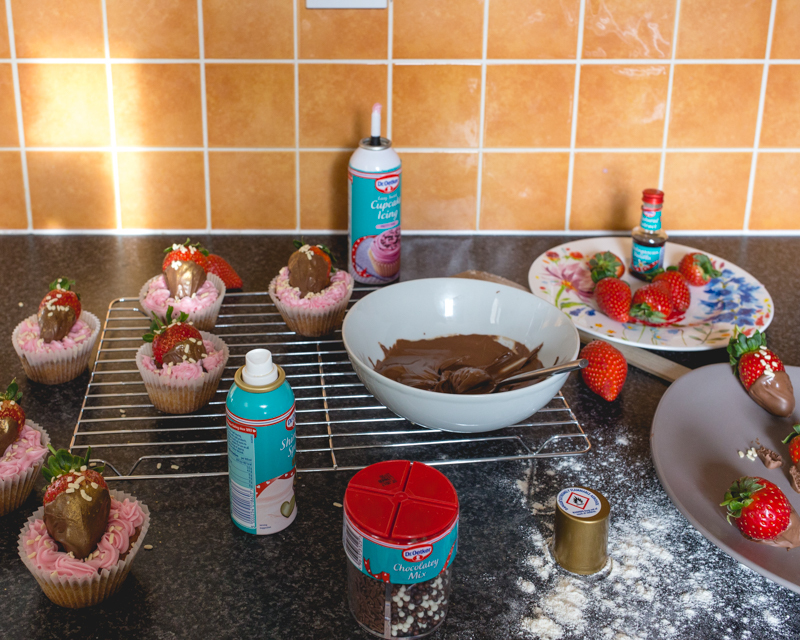 So I decided to give it a go with my creation, Salted Caramel Cupcakes with Chocolate dipped strawberries. 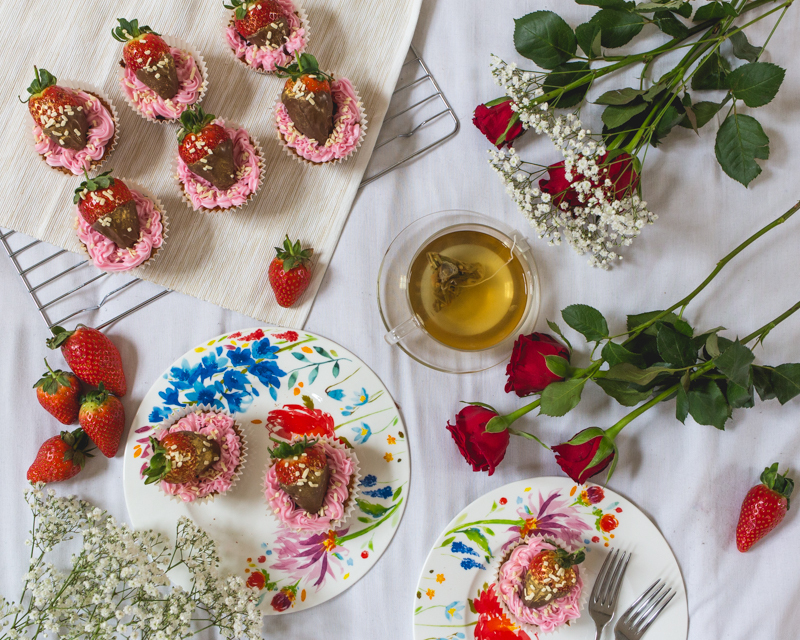 If these don’t get you into the Valentine’s day mood, I don’t know want will! 1 Preheat the oven to 180C or Gas Mark 4 and line a muffin tin with paper cases. 2. Beat the butter and sugar is a bowl until smooth and creamy looking. 3. Beat the eggs and vanilla in a separate bowl to combine, then once done so, add into the butter mixture and stir in thoroughly. 4. Sift the flour, baking powder and salt into the mixture bowl and again combine until a pale mixture. 5. Spoon into the paper cases and bake for 20 minutes until golden. 6. Let them cool on a wire rack before decorating. 7. Once cooled, pipe into the centre of each cupcake, the salted caramel mixture. 8. Then pipe on top, the pink swirl icing. I found it easiest to do a swirling hand motion to get a nice finish. 9. Next melt the chocolate in a bowl, and dip your strawberries in, covering half. You might also need a spoon to help you. Allow to set. 10. 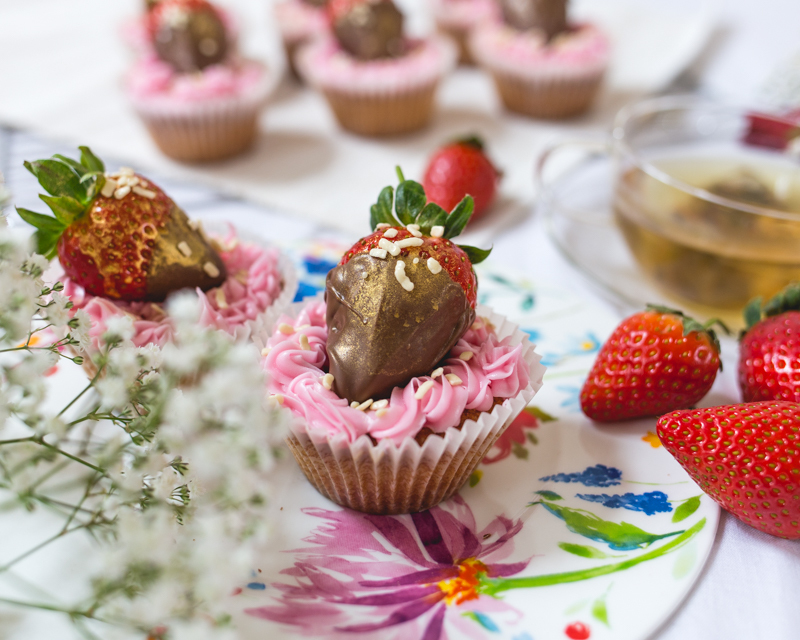 Once set, place on top of your cupcakes and spray gold with the shimmer spray and sprinkle on the white chocolate bits. 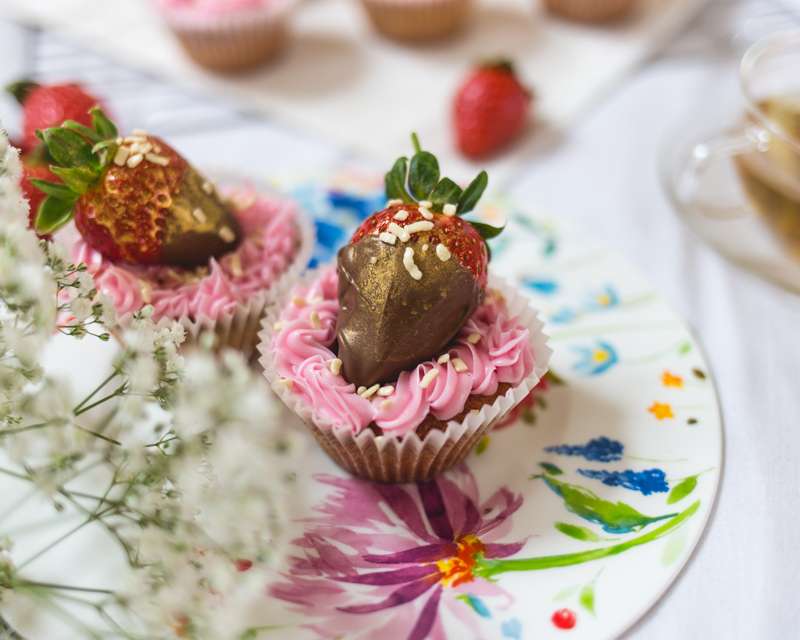 And there we go, handmade Valentine’s cupcakes which are sure to impress your other half. And if your single? Well I’d go right ahead and make these just for you. Hey, at least then you get to choose the movie you want to watch. Whatever you are doing this Valentine’s Day, have fun kids. This post was sponsored by We Bake. As always, all words, ideas and photos are my own.